If you don’t have your campfire permit for western national forests, see the campfire permit page at the Sequoia National Forest website. It’s a download, fill out, and sign thing good to the end of the year. The Friends of Washoe County Library will have their Spring 2010 Booksale Bonanza at 5205 Mill from April 24 to May 2. The booksale prices are mostly 50 cents to a dollar in the main section of the sale. There is a very large selection of Fiction, Non-Fiction, CDs, DVDs, old records, cassettes and videos, children’s books, and books for people of all interests. This might be an opportunity to collect some reading material for those quiet hours in the woods on your next campout. Controlling trailer sway is often a hot topic in discussions. It is often difficult to figure out what to do to make sure the trailer stays behind the tow vehicle or why trailer sway happens. The recent labeling of the Lexus GX as a ‘do not buy’ by Consumer Reports (CR) has related causes. Why the Lexus GX may be rollover-prone (and the 4Runner isn’t) covers a number of issues that will help those towing trailers understand what is involved in rig stability and what modern vehicles do about it. The first item is about oversteer. Trailers tend to exaggerate this because they push the rear out in when turning. “Cornering oversteer is something automakers try to avoid, except on high-performance sports cars. On SUVs with a high center of gravity, this is an especially serious problem”. Coupled with oversteer is that of lifting the throttle that CR uses in its tests to aggravate problems. Lifting throttle and failing to compensate for oversteer are primary contributions to trailer sway problems. Electronic Stability Control Systems (ESC) were first adopted in the late 1990’s to combat the problem. “ESC relies on signals such as steering angle, lateral and longitudinal acceleration, yaw rate (the rate of rotation around the vertical axis), brake and throttle position, among others.” These systems can make your RV experience safer and more pleasant but, as in the Lexus case, they may not be tuned quite right and that may create problems. It would be easy to read this article and just write off the problem as a technical, even computer, issue. That would be to miss what is being said about SUV’s, typical vehicle stability factors, and the implications of CR’s tests that are intended to bring out typical vehicle behavior problems. There are some things to learn that you can use to enhance your RV driving experience and comfort and safety. The Recreation Vehicle Industry Association (RVIA) says this year represents the 100th anniversary of RVing. MSNBC carries the story RV travel: 100 years and counting. Of course, this is motorized vehicles with a focus on the recreational and avocational. More than a hundred years ago, a motor vehicle was something of an oddity to start with. What this anniversary shows, though, is that the camping spirit quickly adapted to a new technology – automobiles – to be able to take more stuff to more places with more style and comfort than ever before. Keep an eye out for stories about this centennial. If you don’t see any, why not write one? Fifty years on: Here’s the trailer Jay and Sheri adopted as it was in its prime. 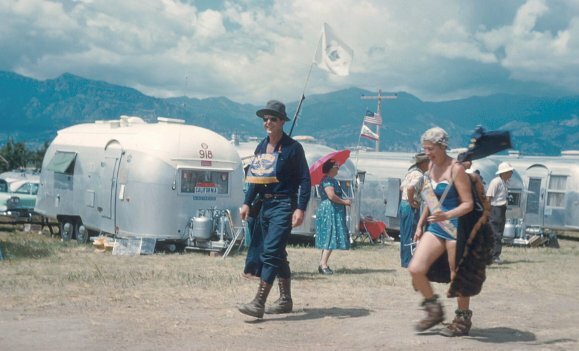 It was the base for good times at a 1960 Colorado Springs rally parade. It may be that such times are in the future for this one again. The march of progress often goes by with little notice. CB radio was the primary option for in-vehicle communications only forty years ago and cell phones didn’t become a real option until about ten years ago. Fuel injection for vehicles really only become common something like twenty years ago and now the automotive computers carefully control engine fuel use in harmony with transmission gearing and other factors. Suspensions have also improved. The last stage in developing robot capabilities in the automobile is in driving. Personal Navigation Systems are one step in this. TGDaily describes research that allows the automobile to stay in its lane without human control. Already in cars are automatic parallel parking features, braking assistance, collision alarms, and trailer sway control. Being able to stay in line means being able to determine if the current vehicle path is staying in lane. That ability could be used to wake up a drowsy driver who might be driving off the road or into oncoming traffic – which is a major cause of traffic crashes in Nevada. Maybe, one of these days, the joke about the new moho driver who sets the cruise control and then heads back to the bathroom won’t be such an odd absurdity. Perhaps the joke will be the moho doing a panic stop while on autopilot and what that does to the driver back in the bathroom. Just you wait. We live in interesting times and driving is not like what it was just a few years ago – and will likely change just as much a few years hence. 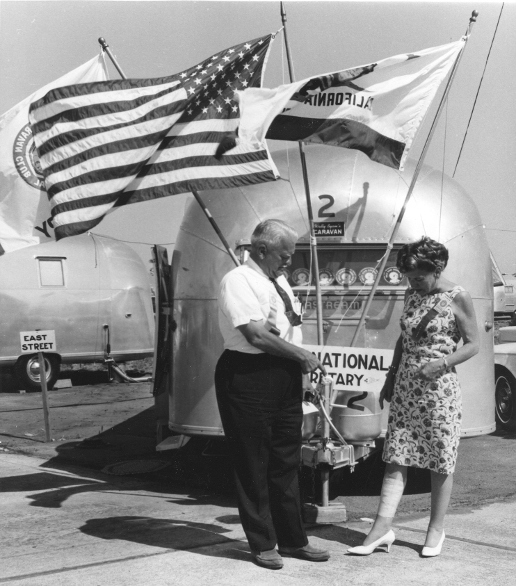 Fifty years ago, in 1958 the 1st International Caravan was held in Bull Shoals, Arkansas. It tied in an annual meeting rally for friends that were separated only by miles, but not by common interests. The WBCCI was not three years old. Dale (Pee Wee) Schwamborn shares his photographs from the early days of the WBCCI.